The core narrative of Christianity, the book that conveys it (the Bible) and the institution of the church have been marginalised by the development of modernity and post-modernity. Strangely, post-modernity created an opportunity for religious thinking and experience to re-enter many lives. Yet post-modernity is not an adequate framework for thinking about life. There is therefore an opportunity for Christians to imagine what comes after and to prepare the church for a new engagement of mission with western culture. The church, through a creative missionary imagination, can re-define western cultural life. This sketches what such an approach might look like. Roy Searle, Northumbria Community, former President of the Baptist Union of Great Britain. - Publisher The core narrative of Christianity, the book that conveys it and the institution of the church have been marginalized by the development of modernity and postmodernity. Strangely, postmodernity created an opportunity for religious thinking and experience to reenter many lives. Yet postmodernity is not an adequate framework for thinking about life. There is therefore an opportunity for Christians to imagine what comes after and to prepare the church for a new engagement of mission with western culture. Thechurch, through a creative missionary imagination, can redefine western cultural life. This sketches what such an approach might look like. - Publisher The church after postmodernity. The core narrative of Christianity, the book that conveys it (the Bible) and the institution of the church have been marginalized by the development of modernity and post-modernity. Strangely, post-modernity created an opportunity for religious thinking and experience to re-enter many lives. Yet post-modernity is not an adequate framework for thinking about life. There is therefore an opportunity for Christians to imagine what comes after and to prepare the church for a new engagement of mission with western culture. The church, through a creative missionary imagination, can re-define western cultural life. With a boldly crafted vision this book sketches precisely that. 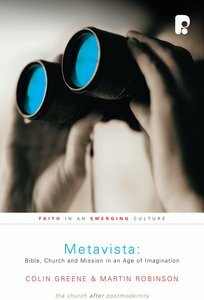 About "Metavista: Bible, Church and Mission in An Age of Imagination"
The core narrative of Christianity, the book that conveys it and the institution of the church have been marginalized by the development of modernity and postmodernity. Strangely, postmodernity created an opportunity for religious thinking and experience to reenter many lives. Yet postmodernity is not an adequate framework for thinking about life. There is therefore an opportunity for Christians to imagine what comes after and to prepare the church for a new engagement of mission with western culture. Thechurch, through a creative missionary imagination, can redefine western cultural life. This sketches what such an approach might look like. The church after postmodernity. The core narrative of Christianity, the book that conveys it (the Bible) and the institution of the church have been marginalized by the development of modernity and post-modernity. Strangely, post-modernity created an opportunity for religious thinking and experience to re-enter many lives. Yet post-modernity is not an adequate framework for thinking about life. There is therefore an opportunity for Christians to imagine what comes after and to prepare the church for a new engagement of mission with western culture. The church, through a creative missionary imagination, can re-define western cultural life. With a boldly crafted vision this book sketches precisely that. Dr Martin Robinson is the National Director of Together in Mission. In his early 20s Martin trained for the ministry and his first church was inner city Birmingham. That muti-ethnic congregation engaged in church planting and Martin together with his wife Lynda went to lead one of those church plants. After 13 years in local ministry, Martin went to work for the Bible Society in a variety of roles. In his role as Director of Mission and Theology and since, Martin has written many books on the broad theme of mission, including Faith of the Unbeliever, Thinking Clearly: Why The Cross? ; Invading Secular Space; Winning Hearts, Changing Minds and most recent with Paul Griffiths The 8 Secrets Of Happiness. In 2002 Martin joined Together in Mission as the National Director.